The quest for low temperatures in atomic gases started already a few decades ago and was initially driven by the efforts in precision spectroscopy. This quest saw two magnificent highlights with the attainment of Bose-Einstein condensation (1995) and degenerate Fermi gases (1999) in alkali gases. Since then, the fields of quantum gases, ultracold atoms, and related topics experienced a vast expansion and seem to grow ceaselessly. A handful of elements have been condensed so far, each with its unique properties, opening new avenues of research. Strontium and two-electron systems in general have always been of particular interest, because their narrow intercombination lines can be used for frequency metrology. A few years ago, new proposals appeared to use other properties of Strontium to model complicated Hamiltonians or even build components of a quantum computer. Some of these properties are related to the electronic structure: The magnetic moment of the electronic ground state vanishes, and the nuclear spin essentially decouples from the electronic state. However, many of these applications require coherence or extremely low temperatures. for different times of the evaporative cooling ramp. Earlier efforts were directed towards the condensation of the two most abundant isotopes 88 and 86. The isotope 88Sr has a scattering length of almost zero, and efficient evaporation was hindered by low thermalization rates. On the other hand, the scattering length of 86Sr is extremely large, and molecule formation during evaporation led to atom loss and heating, again obstructing the way into degeneracy. Also a mixture of these isotopes resisted further cooling. One possible way out was the use of the less abundant isotope 84Sr, which has a scattering length comparable to rubidium. This path was taken by both our group and the group of Tom Killian at Rice University, TX (USA). BEC was reached by these two groups in September and October 2009. Inversion of the aspect ratio during the expansion of a pure BEC. The images are taken along the vertical direction. The first image is an in situ image recorded at the time of release. The further images are taken 5, 10, 15, and 20 ms after release. Both groups follow a very similar cooling strategy: A so-called blue MOT is operated on the strong singlet transition. 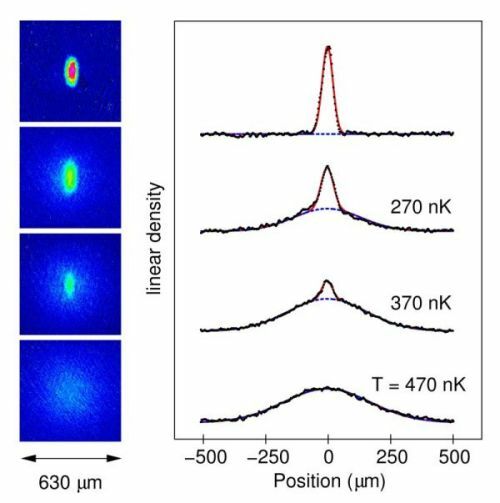 A small decay channel from the excited state populates a metastable triplet state, which carries a magnetic moment and can be trapped in the quadrupole field of the MOT. After accumulation of roughly 108 atoms, they are pumped back into the ground state to start the second cooling phase: in the case of strontium, this is the so-called red MOT phase, operating on the narrow intercombination line. As the reachable Doppler temperature depends directly on the linewidth of the transition, exceptionally low temperatures can be reached: 2.5 μK at the final stage of this cooling step. Afterwards, the atoms are loaded into a rather conventional crossed dipole trap. The trap depth is carefully lowered, evaporating the hottest atoms. Thermalization of the remaining atoms is very efficient, and the anticipated phase transition into the BEC is seen at around 400 nK. The condensation of strontium seems to be more robust compared to similar species such as calcium and ytterbium, and the atom number of some 105 atoms is considerably larger. The other three isotopes of strontium are very different and equally interesting. A BEC of 88Sr would be an almost non-interacting ensemble, ideal for precision measurements. On the other end, 86Sr has a naturally high scattering length that could otherwise only be reached near Feshbach resonances. And then there is the fermionic isotope 87Sr, which is addressed in most proposals for novel quantum systems. We are certain that the exploration of quantum-degenerate samples of strontium has only started.